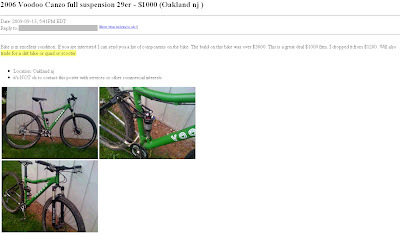 It saddens me on two fronts looking at the ad above: Giving up your mountain bike for something motorized; and it's a 29er, too. 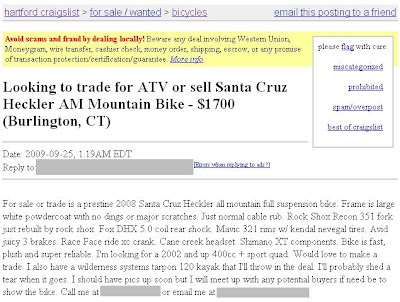 Has this person given up on the Kewl Aide, not to mention mountain biking? I hope he has another rig in the stable, however, it still feels like spit in the face to go this route. Closer to home, someone in Burlington, CT wants to go motorized in an area that is famous for great mountain biking trails and has issues with illegal motorized use. What further makes me upset is the potential fact that now that this person probably knows all the trails he could very well planning to hit them with a motorized application. That would be bad. I hope that is not the case.